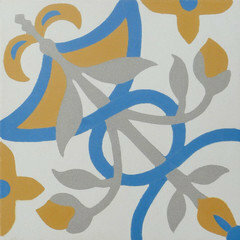 Tiles like these can be found at ARCHARIUM tile & stone. 949-429-7949 This was an excellent installation by the tile contracto, too! Try Galleria Tile in San Francisco- many Spanish Revival style clay and porcelain tiles. Was the tile custom made at this Fire place? If not who is the source for tile? Can you tell me what the floor is.. Tile? if so what tiles, or is this natural stone? Its wonderful.. So sorry for the delay in responding to you Tina! I am only just seeing your message. 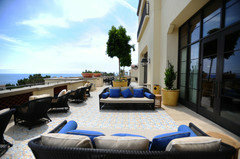 The floor in our photo from the Terranea Resort & Spa is also hand made cement tile by Granada Tile. The pattern is St. Tropez. I have attached a shot of the same deck facing the other direction and a close up of a single tile. For more installation shots, please go to: http://www.granadatile.com/cement_tile_photo_gallery.php. Where can I find the tiles that surround the fireplace? I am interested in purchasing the tile around the fireplace. Is it available through you and does it come in other palettes/designs/etc. Thanks. Fireplace - Are you guys going to alleviate everyone's desperate curiosity about these tiles? Striking fireplace, would love to know how I might recreate it for my Spanish home in Orlando. Do tell! Handpainted tiles like these are definitely custom-made. Together with your designer you can choose from 80 (at least) glaze colors to create different looks with the same design, or create with different designs altogether! Here at ARCHARIUM tile & stone, we have been creating beautiful such spaces. We'll be delighted to be of service, please call 949-429-7949.
mentel - I am looking for this fireplace mantel, or one similar. Can some tell me where to find this? I found a sofa and chair like this in a designers consingment shop (with different, older cushions that I am recovering in white). Where did you find your chair? Where can I find the tiles around this fireplace? - Thanks! The floor tiles look like natural stone, but there are wonderful looking porcelain tiles that look old and worn, too. The fireplace tiles are wonderful, we can work with you to select designs and colors from assorted glazes to create yours as unique statement! These colors are delicious! Where can I find the furniture please? please tell me where i can purchase a mantel like this? Beautiful! Talented designer. Willing to share tile source? Thank you. Pillows - Where did you find the blue pillows? If you had them made, where did you purchase the fabric? Thanks. Rustic Details (Detalles Rústicos)Spanish-style architecture, similar to Mediterranean style, boasts great rustic details. This fireplace features a single rustic timber as a mantel against the earthy elegance of the Mexican tile on the surround. 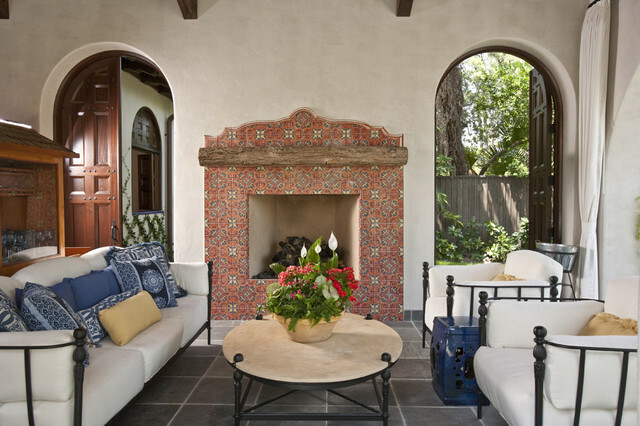 Just a bit of tile around the fireplace gives this whole place a hacienda look. Outdoor living room. This outdoor living space feels just like an indoor living room. The fireplace acts as a focal wall but still allows for an open space. Tip: Even with simple architecture, an outdoor fireplace can be customized and accented with the choice of surround and mantel materials. Like the tile surround for an outside fireplace.